Solar Minimum Sunshine 9th February - SolarChat! Saturday morning was one of those race against time mornings. I woke far too early - Mrs Townley was not impressed, either way I enjoyed watching it get light with a mug of coffee. I could see on SAT24 that it was clear (then), but also cloud was coming fast. I set up with the SM90 and the PGR GH3 ICX814, and by then it was a case of pressing the stop start button in Firecapture to avoid the scudding clouds. Nothing to see here, move along... Saturdays disk is fairly typical of a solar minimum sun - the disk looks blank. There is a small region of very decayed plage from active regions several rotations ago but that it is it on the surface. 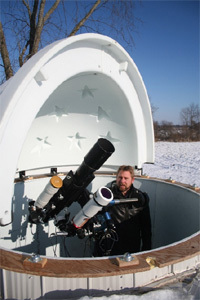 The proms were the star of the show, and looked fantastic through the SM90 with an 18mm Coronado Cemax eyepiece. 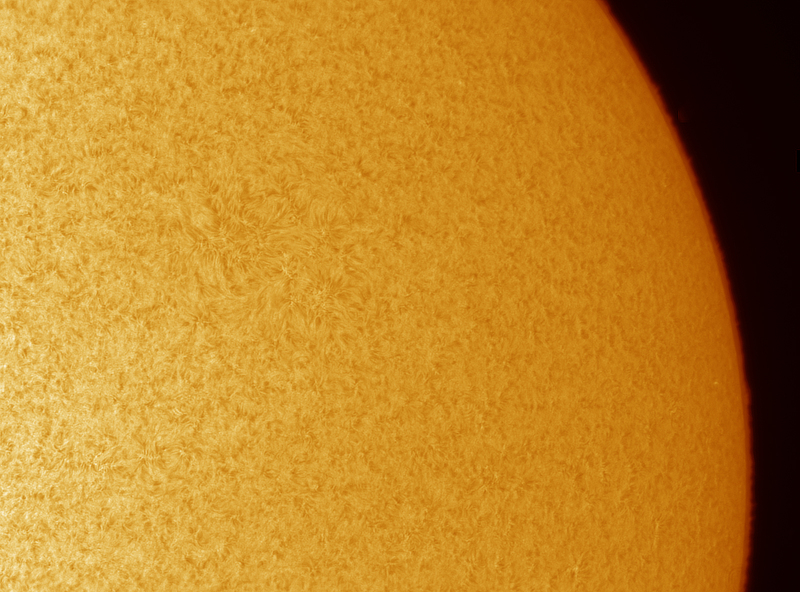 This image is a composite disk / proms shot with the PGR GH3 ICX814 camera. Poor seeing and haze were the order of the morning to give imaging that extra challenge, but it is nice to see the sun rising higher and higher in the sky with each passing week. Wonder how long these conditions will last until we see the signs of cycle 25 becoming more predominant and obvious in the solar northern hemisphere? The proms look great and you captured that decayed AR very nicely. Glad to see you’re getting a little sky time again. Really nice evenness on that disc Mark! 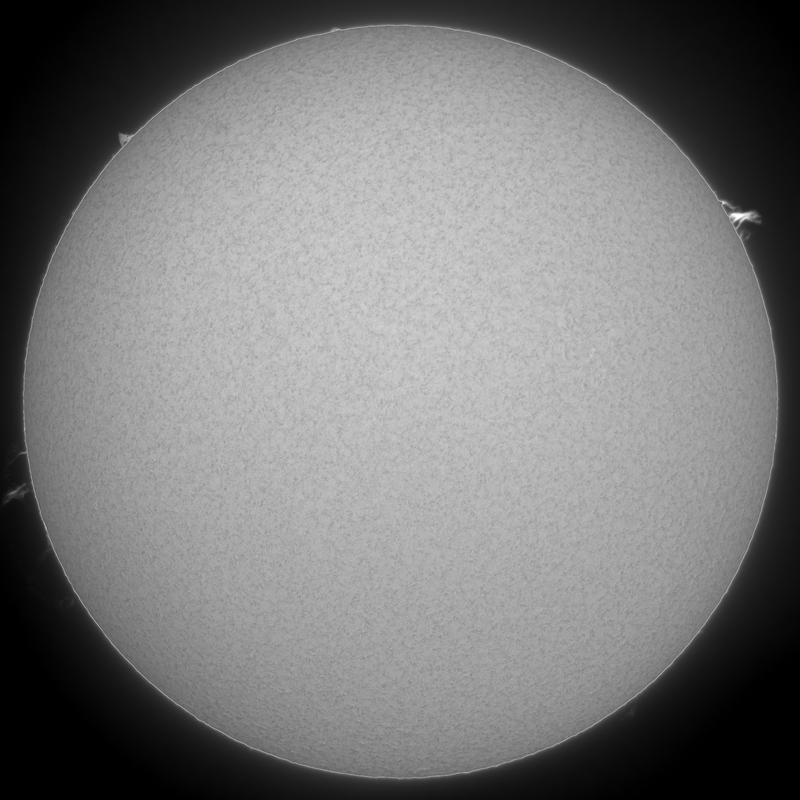 Good result Mark, good to see the Sun is high enough (just) for you to start imaging again. Hi Mark: good results, the 814 camera seems to be working well with the SM90. With that size pixels, can it also be used with the HaT, maybe with the 0.7 focal reducer ? It is very annoying to pause and start every time a cloud passes by. That's a great full disc Mark, fantastic proms I remember at the start of solar cycle 24 you were one of the first people to catch a massive prom on the Sun, wasn't it used on Spaceweather or NASA or something? The new scope and camera certainly make a great pair!!! That’s a very nice disk, Mark. A closeup of the relic active region, SM90, 2.5x barlow and PGR Blackfly IMX249 camera. Your SM90 rocks, Mark. Pretty amazing for a single stack. Thanks Franco, I probably won't use it with the HaT even down at f22. 9fps is way too slow at that scale, it works for full disks but hi res needs a higher cadence.